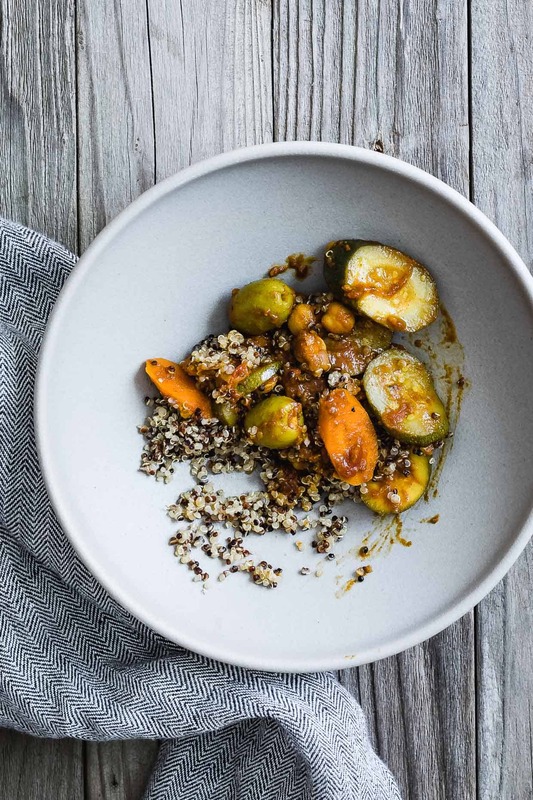 Summer carrots and zucchini stewed up with a spice blend for an ultra-savory dish with sweet pops of dried figs and filled with umami meaty olives. 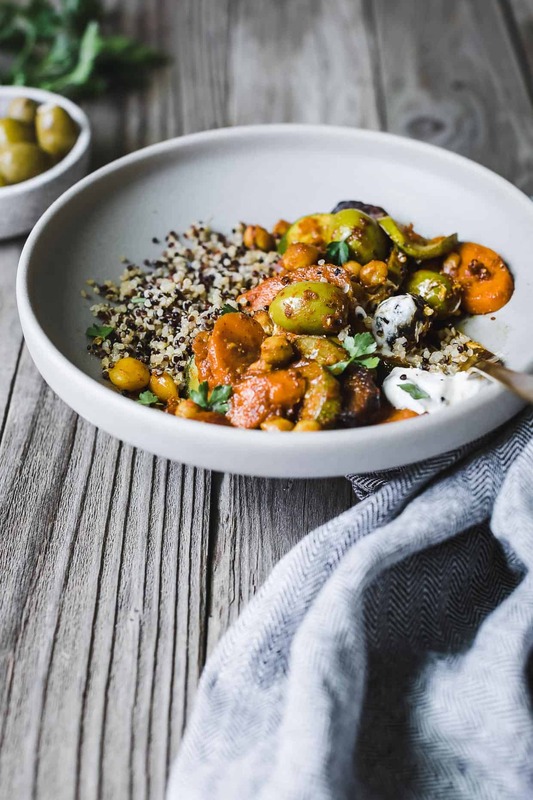 This Moroccan summer vegetable tagine is comforting and full of flavor without feeling heavy or overly rich – served over a bed of quinoa, it’s a perfect vegetarian summer dish! Do spices multiply at the same rate as you scale up recipes? This question boggles my mind. 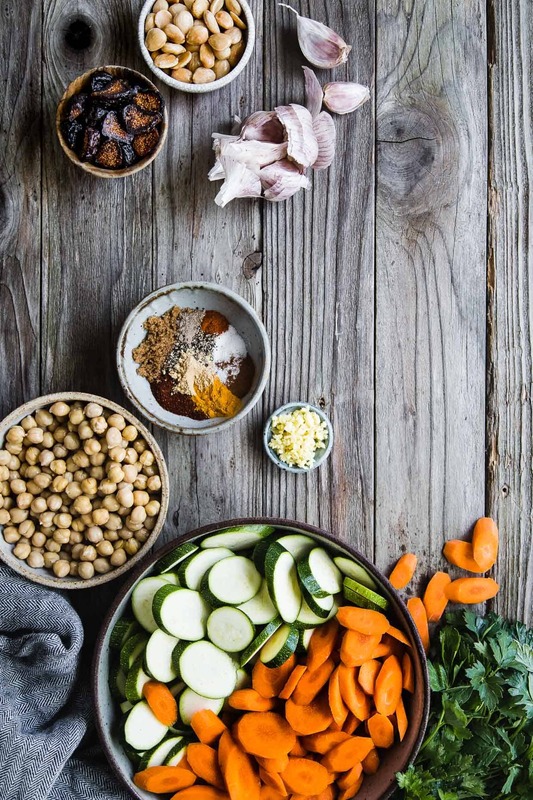 For the first meal at our food styling and photography workshop last June, we quadrupled my well-tested recipe for this Moroccan summer vegetable tagine to serve 16. When we mixed up all the spices, the cardamom suddenly overpowered the blend. I fussed with it a bit, but not too dramatically. Somehow, by the time it all stewed together, the flavors balanced out. I wonder if maybe a spice only seems overpowering in the blend, but when spread among vegetables and cooked, it calms down? Or, if it really doesn’t multiply and, in this case the tweaks I made are what saved the dish, what would happen if I made four separate batches and mixed them together? Even since before it had its big debut at our workshop, I’ve been holding this recipe in my pocket to share with you. “oh my god.” I’m not sure if it’s better or worse that we both forgot. At least we’re terrible people together. We bought a self-help book shortly after Zo was born about preserving marital intimacy and rekindling romance after having a baby, but we each only had time to read one chapter. I guess we should have read that book. Jokes aside, I’ve been a bit emotional about it. With some other personal stuff, this week has brought it all to the surface. I’m sad that we forgot our anniversary – I can’t help but question if it means we don’t care enough. Still, the answer is no – no, it doesn’t mean that. It’s not easy to manage a toddler, full time careers, homeownership, and all other life stuff like laundry and dishes and blackberry bush weeds that threaten your backyard, while still remembering each other. Even though we have a kid and are both working hard to keep things afloat, we are reminded that we still need to carve out time to celebrate just us. So we’re working on that part of feeling whole again. 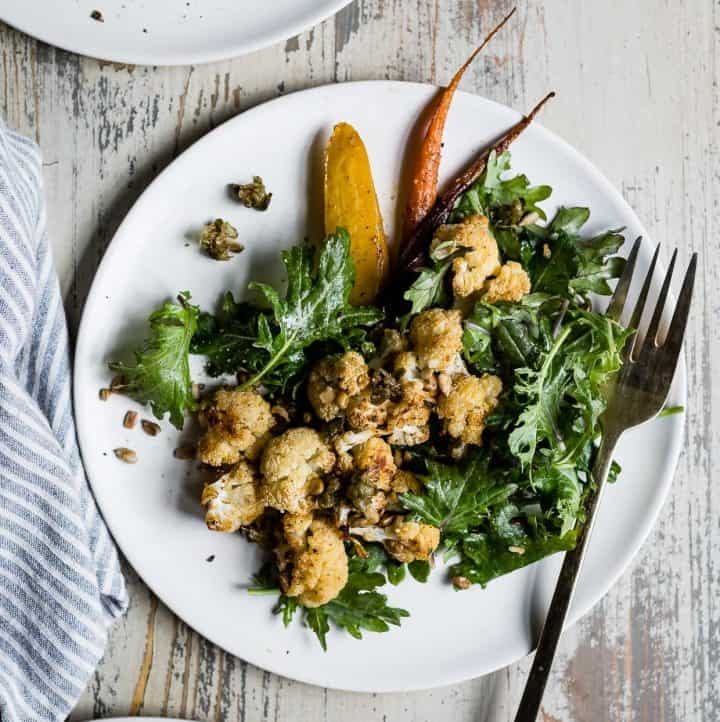 Another goal we’re working on is planning ahead to get hearty dinners on the table that celebrate the season’s produce in flavorful ways (even if the kid still won’t even try them…). 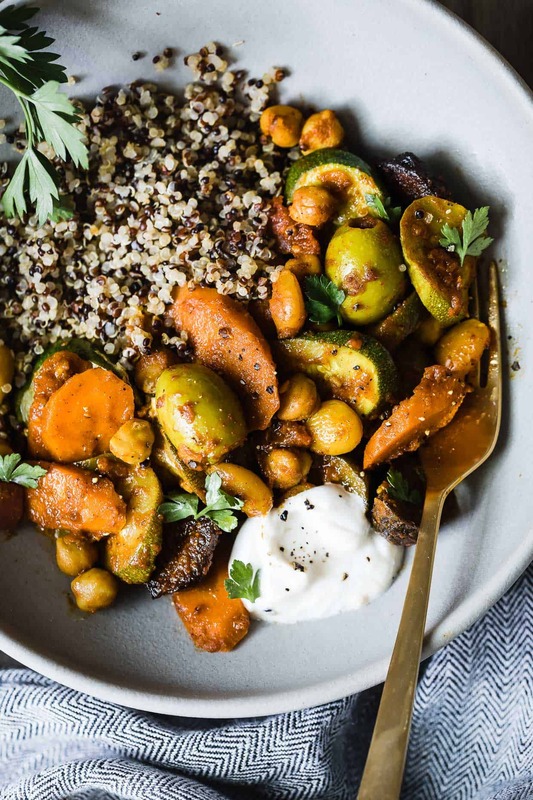 With lots of spices, this summer vegetable tagine is flavorful comfort food that doesn’t feel heavy or overly rich. 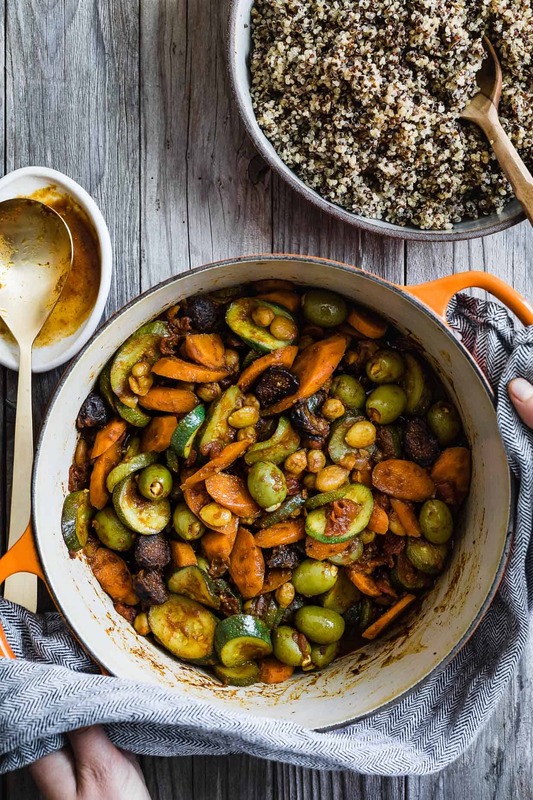 For summer, I like to keep the veggies with a little life, stopping just as the carrots soften, but if you cook a few minutes longer, it’ll get even more stew-like, which is seductively comforting. 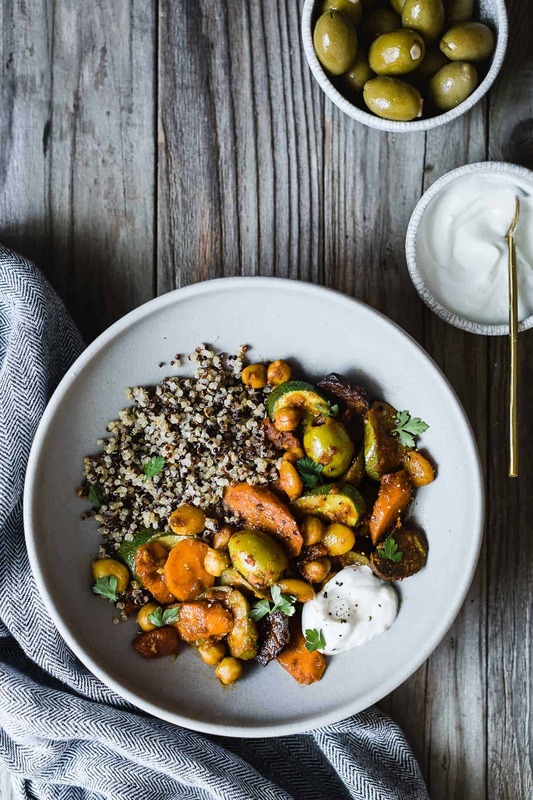 Marcona almonds add crunch against the soft vegetables, the briny meatiness of the olives enhances the umami notes, and creamy yogurt gives a bright reprieve that breaks up the savory spice. 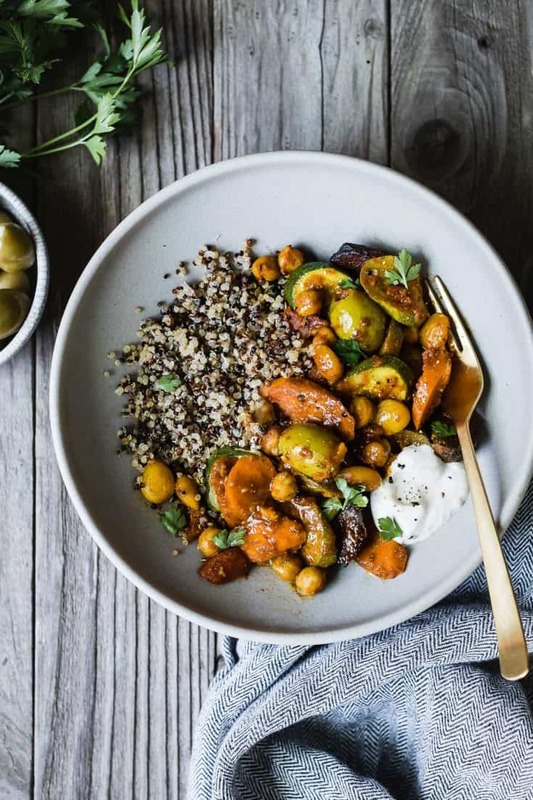 Rather than couscous, I serve the tagine over a bed of mixed grain quinoa to keep it gluten-free – the dual grain mix combines softer white quinoa with more hearty dark quinoa for a pleasing texture. 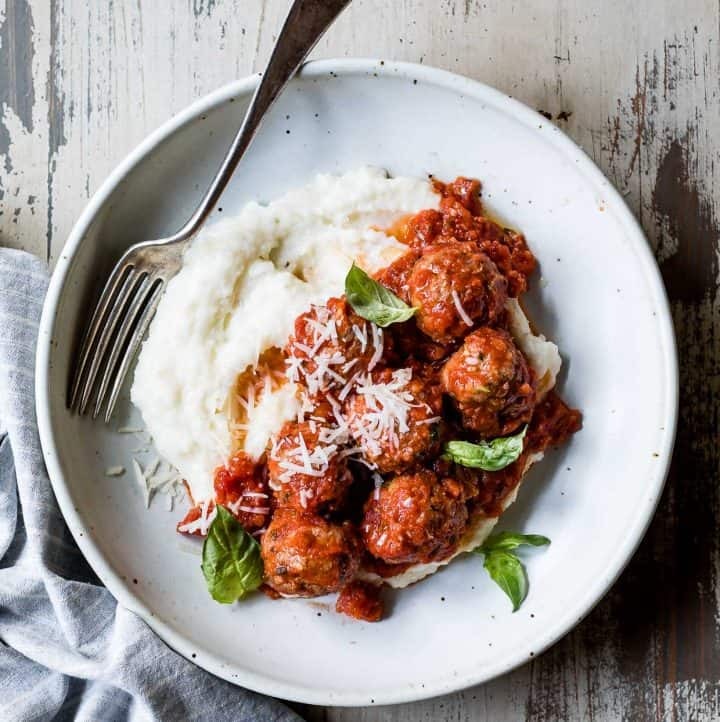 Even as summer comes to an end and the hustle and bustle of fall picks up, we’re going to try to remember to pause to celebrate our connection, our family, and our meals. Heat 1 tablespoon of oil in a large heavy-bottomed pot over medium heat until hot but not smoking. Add the fresh ginger and garlic and sauté for 1 minute. 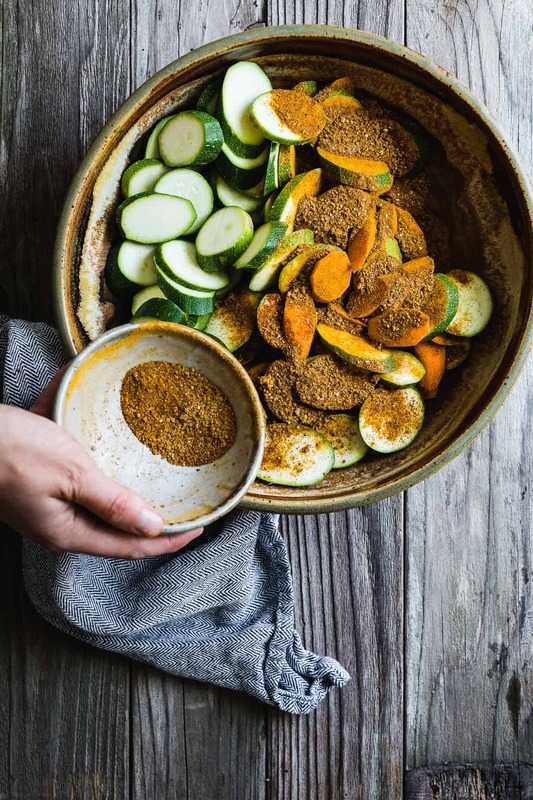 Add the remaining oil and zucchini and carrots with all spices and cook, stirring, until the veggies just start to soften 5-6 minutes. Stir in vegetable broth, tomatoes with their juices, chickpeas, figs, almonds, and tomato paste and bring liquid to a boil. 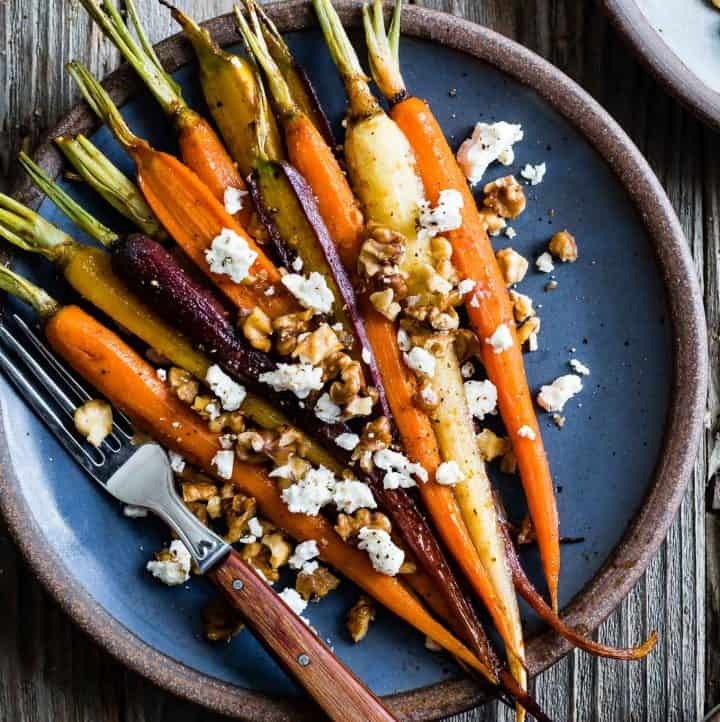 Reduce heat to medium low and cook, stirring occasionally, until the carrots are soft when pierced with a knife, about 25-30 minutes. 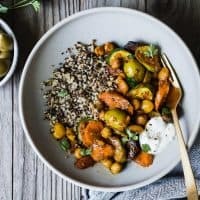 Spoon tagine over cooked quinoa. 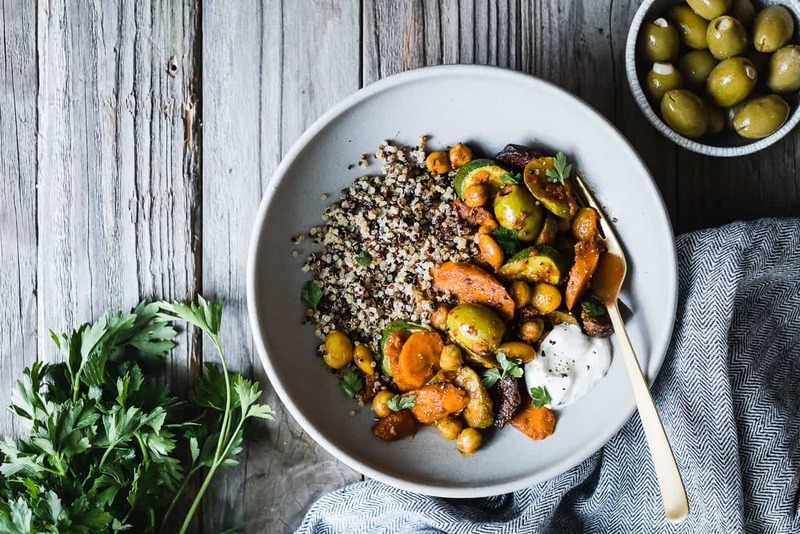 Top with garlic stuffed olives and fresh parsley and serve warm with a spoonful of yogurt. Meanwhile, bring the quinoa and vegetable broth to boil in a small heavy-bottomed saucepan over medium heat. Reduce heat to low and simmer, covered, until the broth has been absorbed, 15-20 minutes. Take heart! Everybody forgets their anniversary at least once! But now that you have that out of the way, you’ll be sure to remember it from now on! Don’t worry, I’m a personal witness, the magic isn’t gone for you guys :) Sometimes you just have a lot on your calendar. It is good to have moments like this to refocus though, right? To take a second and go, whoa, okay, let’s zero in on what our ACTUAL life priorities are. It’s good for the soul, and for your marriage! Love you guys! I can almost taste this!!! 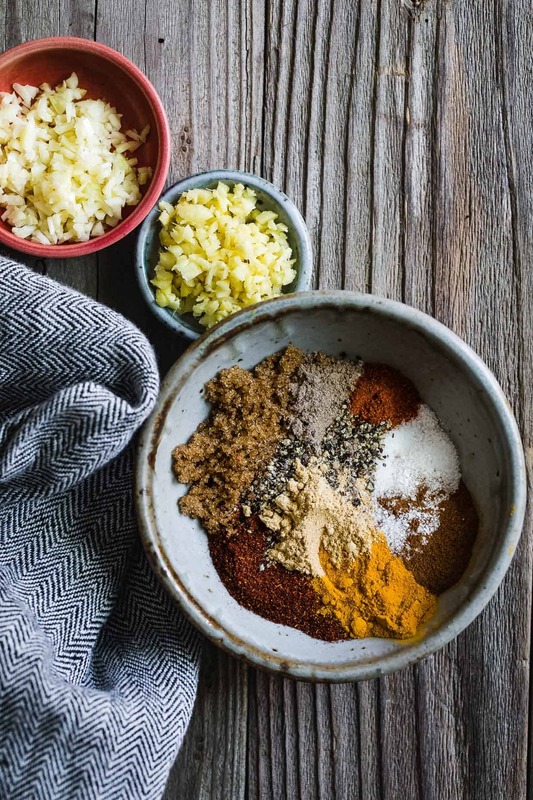 Sounds so good, and I love all of the lovely spice combos (cardamom is my fave thing ever). And the photos are gorgeous, as always, Sarah! hahah, want to hear something bad? erlend and i don’t even know when our anniversary is. you guys are doing great! Sarah! I made this one for my roommate and I and we both loved it!!!! 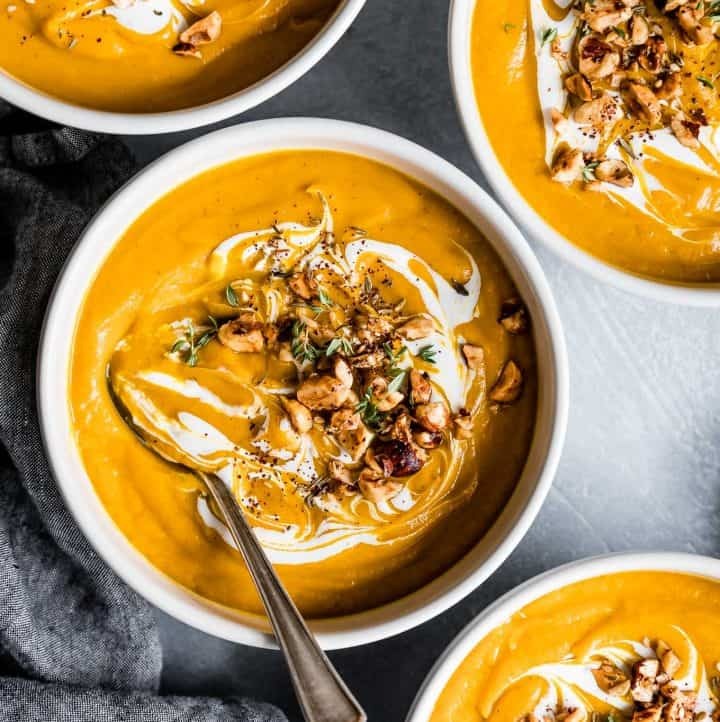 Thank you so much for the delicious and healthy recipe. I hope you are doing awesome!